Tamar Zandberg and Avi Buskila face off in race to determine future leadership of the far-left party. Members of the left-wing Meretz party headed to the polls on Thursday in order to choose the next party chairman. Meretz will also choose its next Knesset slate in the primary vote. The race pits veteran MK Tamar Zandberg against former Peace Now leader and LGBT activist Avi Buskila. Zandberg has been an MK since 2013 and has vowed to transform the party from its status as perennial opposition backbenchers to a position of influence. 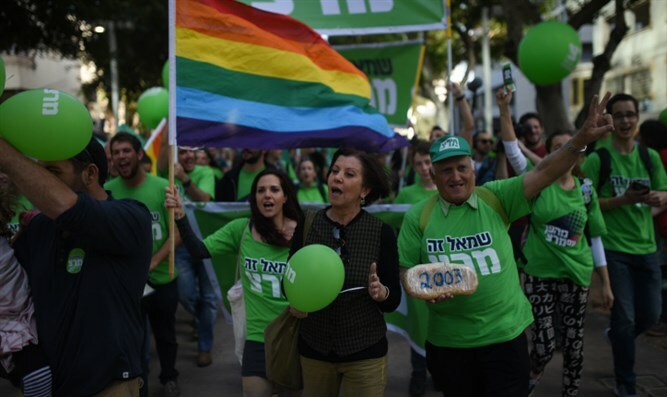 "I call on you to join me and return Meretz as the large and relevant party that we all yearn for it to be, a party that comes down from the bleachers and makes its way to the playing field," said Zandberg. Buskila is a well-known LGBT activist who quit his post as CEO of the left-wing Peace Now movement in order to run as Meretz chairman. In his short tenure heading Peace Now, Buskila distinguished himself for his extreme diatribes against Judea and Samaria residents, whom he accused of racism. Buskila had previously been a copywriter at an advertising firm and had served in the IDF's Nahal Brigade for 12 years. The primary is the first time the left-wing party has allowed its 31,680 members to choose their leader, as the party jettisoned its previous system in an effort to drum up enthusiasm that would reverse the faction's declining electoral fortunes. Observers say that Zandberg is the leading candidate after MK Ilan Gilon and party chief and former MK Zahava Gal-On had dropped out of the race in late February.